One of the 4 houses below looks like yours. See what kind of retrofit you need. Many Bay Area residents believe Bay Area Retrofit is perhaps the best retrofit company out there. In general we retrofit homes built before 1940 because they have a weakness called a cripple wall. You will find the cripple walls under the floor you walk on. Three steps leading into your front door means you have a cripple wall. When the earthquake hits and your cripple wall collapses, your house will collapse with it. Not only will you need to clean up the mess, lose work, and need temporary shelter but losing a home has a terrible financial impact. Earthquake insurance cannot protect you against this. A retrofit usually costs 1-3% of a home’s value. Certainly a good investment relative to the misery avoided and financial loss. The Northridge Earthquake damaged or collapsed 95% the cripple walls near the fault. 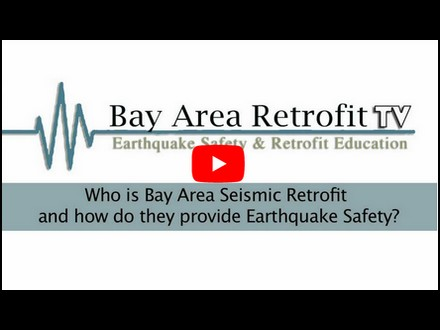 If you want to protect your home find a seismic retrofit contractor and without delay retrofit your home with proven seismic retrofit technology. I mean without delay, because we truly are overdue for a large earthquake. Geologists would not be surprised if it happened today. 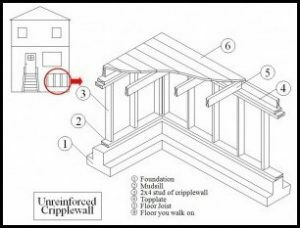 A cripple wall retrofit is the process by which cripple walls are converted into shear walls. Homes built on hillsides also have cripple walls and a seismic retrofit contractor must address them in a different way. You will find homes with cripple walls in the older neighborhoods of Oakland, Berkeley, Albany, El Cerrito, and Richmond. 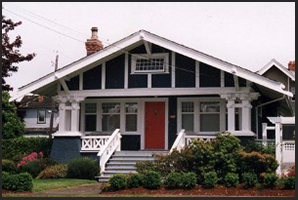 Older homes built before any earthquake protection regulations were part of the building code are especially vulnerable. This is not to say newer cities such as San Jose, Sunnyvale, and Fremont don’t have older neighborhoods. It just means by and large the homes in these cities require retrofits for flat lots. After approximately 1940, houses were no longer built with cripple walls unless they were on a slope. This is especially true in newer cities such as the cities of San Jose, Sunnyvale, Fremont, Santa Clara, and Los Altos. Fremont is very close to the Hayward Fault and here these retrofits are in high demand. San Jose since has required foundation bolting 1927. Fremont has required bolting since 1956. All cities in the Bay Area since 1958. Nor have the size and spacing of the bolts changed much. The bolts are not a problem, the fact they have over-sized holes is. Bolted houses with over-sized holes still benefit from a retrofit. The house will without a doubt need shear transfer ties. And while you are at it, might as well compensate for the over-sized holes. Ask your seismic retrofit contractor how much this kind of retrofit will cost. Earthquakes still put bolted homes at risk. The building lacks many provisions that will protect the public. The California Building Code has some inherent deficiencies regarding earthquake protection. Building officials, volunteers, and representatives from different agencies and the construction industry all have input. The latter group does what it can to keep costs down by reducing seismic safety. Its stated purpose is to protect people’s homes, including against earthquakes. In some ways it is successful, and in others it is not. The building code changes constantly. It incorporates insights we gain after large earthquakes occur because of popular pressure. It also changes as a result of pressure from special interest groups. The well-funded National Association of Builders (NAB), lobbies to make construction costs as low as possible and resists these changes. 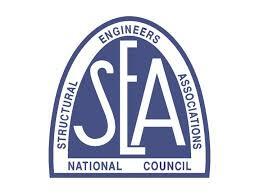 A seismic retrofit contractor needs to understand the science without regard to flawed building codes. When the Shaking Starts, What Do You Do? This is a first-hand account from interviews with hundreds of earthquake survivors. The Red Cross speculates the consequences of an earthquake; I can tell you what I saw. The most important thing to stress is that you will be able to enter your home. It is not necessary to keep supplies of water and food in a secure area outside of the house. 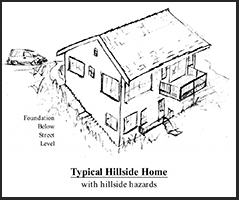 Unless your house slides down a hill you will be able to enter the house after the earthquake. You will have at least 40 gallons of water in your water heater which should be plenty until help arrives. For this reason it is critical that you securely strap your water heater to a wall. All non-perishable food will be available for the same reason. It is critical to keep canned food, a can opener, and a camping stove somewhere in the house. It is also important to keep enough critical medicines on hand to last you at least two weeks. Hopefully you are not on dialysis! The impacted people in your neighborhood will naturally come together after the earthquake. 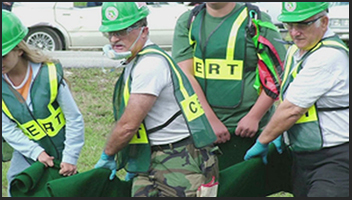 People seek each other’s help after a disaster. Neighbors need to check on each other and see if they are injured. Don’t forget the dogs and cats, and fill up the aquariums before the fish die! Homes with living areas above a garage area have something called a “soft story.” Their complexity makes them one of the biggest challenges for seismic retrofit contractors. Look at the garage door opening. The narrow walls on either side of the garage support the floor above the opening. These narrow walls are equivalent to and act like posts. If an earthquake tips them over you can imagine the extent of the damage. Seismic retrofit contractors address soft story buildings in a couple of ways. If the walls on either side of the garage are wide enough, you can build standard shear walls. If the walls are too narrow, some hardware companies have invented super shear walls that can be much narrower. Another approach is to use a principle called rotation where shear walls are built on the the back and two sides of the garage. Sometimes a custom-made large vertical steel beam is embedded in concrete and attached to the floor above. All of these methods work. 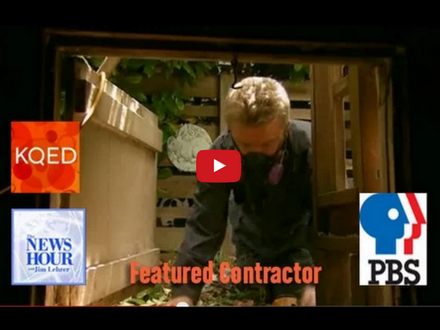 It is up to the seismic retrofit contractor to figure out which is the best approach. Bay Area Retrofit as a rule installs vertical column systems. A new possibility is a column system that has a fuse which breaks before the column itself is damaged. Without a fuse a column can only be used one time and then replaced at great expense. These columns can be used earthquake after earthquake. The patent is pending but from what we can see it will be the best system of all. Home built on steep lots are very dangerous in earthquakes. In fact, they are life threatening. Damage observed after after the 1994 Northridge demonstrated the California Building Code could be fatal. Southern California now ignores the California Building Code when it comes to new hillside homes. They also developed hillside home retrofit building codes. A competent seismic retrofit contractor or engineer will be aware of them. You should ask him. First responders discovered a house that should have collapsed survived the earthquake just fine. A brilliant architect speculated earthquake damage would occur using conventional building codes. He then built a hillside home unlike the other homes in the area. 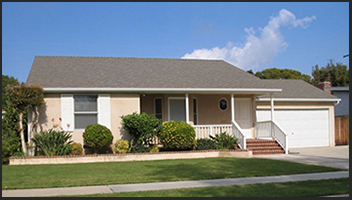 Without intending to, he created the Los Angeles Hillside Home building codes. The first in the country. Do not consider any other code when retrofitting your hillside home. It is the only retrofit building code that one should even consider. Very few seismic retrofit contractors know how to install hillside home retrofits. And they normally cost tens of thousands dollars, but they could save your life. The information on this website will help you spend your money wisely on an effective retrofit at a reasonable price. 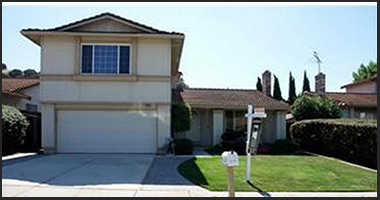 It is important to understand the methods used for other types of houses. All houses have a little bit of each type of the other types of houses. For example if you live in a houses with a cripple wall, you might have sections that do not have cripple walls. If you live on a steep hillside home, part of the house will require a cripple wall retrofit. At the same time, parallel to the street you will need a no-cripple-wall retrofit. Most houses on a slope need stepped foundation retrofits. In any event, I recommend you take the half hour or so needed to study and understand this material. It can save you money and perhaps your life. Knowledge is power: The more you know, the better able to evaluate bids from seismic retrofit professionals. Instead of being at their mercy, you can to speak to them on equal terms. You may be more knowledgeable than they are. Personally I am still learning after 25 years, and hope to do so until I retire. Please, if you have a question contact me at [email protected] so I can address the problem.